At the end of my first Route 66 road trip I saw something made me question everything I knew about Native Americans. If I'd thought about them at all, it was the cliches of my childhood. Red skinned men with feather headresses living in Tepees. Women dressed like Pocahontas. The baddies in the endless Sunday afternoon Westerns. They were a long way from suburban England, part of the playground games of Cowboys and Indians. What I saw on Route 66 was the well preserved ruins of Puerco Pueblo, outside of Holbrook Arizona. At its peak, in 1300AD, 200 people lived in brick houses around a central plaza. This isn't what I knew about Native Americans. I didn't know they lived in houses, in villages. I didn't know they farmed crops. That they lived in conditions little different to early Medieval Britain. Since then the story of America's indigenous peoples has fascinated me. When I saw a restaurant offering 'modern Navajo cuisine' on this year's road trip, I had to visit. The Black Sheep Cafe in Provo, Utah was a short detour, and dinner was delicious (read my review at the foot of this page). It also raised many questions - how authentic was it? Would a Navajo Indian recognise it? What did other Indian tribes eat? And - most importantly - can I learn to cook this at home? Very quickly, I hit problems defining 'Native American Cuisine'. First, there's considerable regional variation - North America is a vast country, and I wouldn't like to be asked to define 'European Cuisine'. While most European countries were defining their cusines as part of their national identities, the Native Americans had more serious problems - theft of their lands, disease and grinding poverty. No one had the luxury of being able to pause and write a cookbook. There's also the thorny issue of 'authenticity'. Do I rule out all dishes that use ingredients brought by the Europeans? I could, but this means winding the clock back five hundreds years. I wouldn't describe English cuisine in terms of the pottage and game diet of the Elizabethans. Nor would anyone modern recognise the jellied meats and offal dishes favoured by the Edwardians. No, just as I would have to consider Chicken Tikka Masala when writing about modern British cuisine, I would have to allow the Native Americans their outside influences too. It's also interesting to consider their influence on American - and British - cuisine. There's the potato, of course, and the turkey, although neither featured that heavily in Indian diets. A stronger influence can be found in the cornbread, grits and tacos that occur all over the South. In fact, it could be argued that Mexican food is basically indigenous American cuisine. The dishes may have Spanish names, but almost none were eaten by the European Spanish. So where to start? The food of the nomadic Plains Indians - the Teepee living Indians of my childhood cliches - was by necessity simple. Bison featured heavily - and would be tricky to get hold of in Waitrose too. The Hopi indians probably had the most refined and well documented cuisine. Living in villages, they had the ability to bake bread and cook complex dishes. Proficient farmers, they had a ready supply of fresh and dried ingredients. There was also considerable cultural cross fertilisation with the Mexican and South American indians. The main Hopi crops were corn, beans and squash. Most beans we consume here in Europe have American roots (the broad bean, or fava, is the only common indigenous European bean). The Natives Americans have been eating wild beans for at least 7,000 years, and eventually learned the secrets of cultivating them. The Hopi developed many varieties of bean and have been growing them since the 5th century. Corn cultivation dates back 4,500 years. It is incapable of sowing its own seeds, and must be planted by hand. This practice gained religious significance with tribes such as the Hopi, and performed with great respect and reverence. The Zuni believed their six colours of corn represented the six points of the compass (including up and down). Navajo legend relates that blue corn came to the people when a giant turkey flying high above the world dropped ears of it from under her wings. The three crops grow together in a simple but perfect symbiosis. The large leaves of the low lying squash suppress weeds, the stalks of the corn provide a vertical support for the climbing beans. The first dish I made was a simple corn and bean salsa - two of the three sisters. I cooked together some tomatoes (another Indian ingredient) with some onions (a rare Spanish influence) and a little jalapeno chilli (an influence from Mexico). 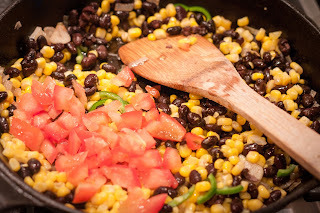 To this I added equal amount of black beans and sweetcorn, plus a little lime and coriander, and warmed it through. Next, the classic Hopi ingredient - blue corn - that I picked up in Taos after visiting the Pueblo. The Hopi believe that this, the hardest of the corns to grow, is also the best. They chose blue corn to symbolize their choice of a life of hardship and humility. 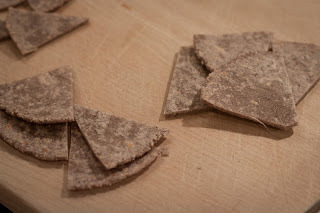 I used the ground corn to make corn tortillas, mixed with twice the amount of plain flour to make it more manageable (without the flour, it's hard to get it to bind). 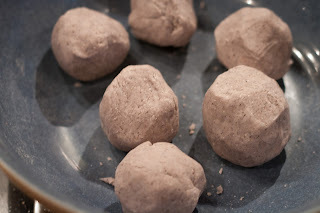 I then rolled a number golf ball sized balls, which I flattened out with a tortilla press. 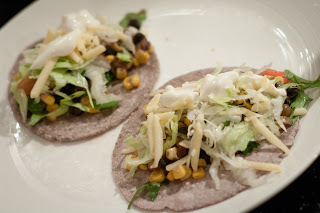 A couple of the tortillas where turned into vegetarian tacos for my daughter. First, a big spoon of corn and bean salsa, then the classic Southwestern toppings of shredded iceberg lettuce and sour cream, with a little coriander. The rest were cut into triangles to made into blue corn chips. I think this is more Mexican than Hopi, but I wanted to see how they turned out. 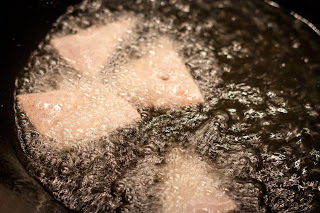 I deep fried them in a wok, and drained them on kitchen paper. 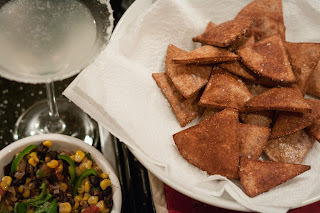 They lost their blue colour and perhaps needed to be thinner to make good crispy chips, but they were delicious none the less and went well with the salsa and a margarita! 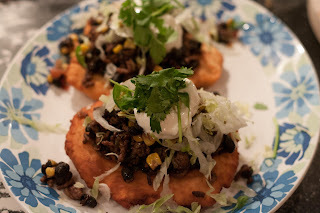 Next a dish that almost anyone from the Southwest would associate with the Navajos - fry-bread. I'd encountered this once before, on an Indian reservation in Florida, but was surprised at how common it was across the Southwest. It seemed to be a staple in the local Mexican restaurants too - I had a delicious example in Holbrook, Arizona. Another example of the cross-fertilisation of cuisines. When I first encountered fry-bread, I was confused how this dish became associated with the Navajos. The adapatable Navajo were a nomadic tribe that learned agriculture from the Hopi and farming from the Europeans. But none of this explained why a dish involving refined wheat flour and lard became the dish most commonly associated with Native Americans. 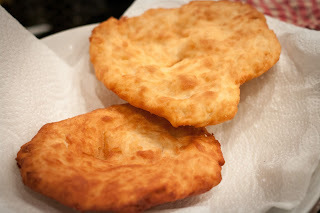 The story of fry-bread is also the story of the appalling treatment of the Indians at the hands of the Europeans. The traditional Navajo homelands were in Arizona, where they lived in villages, growing crops and raising livestock. As the Europeans settlers expanded into this desirable farmland, tensions grew between them and the Navajo. Ultimately, the Navajo were moved by the army to a reservation deep in New Mexico. Some 10,000 Indians were forced to walk 400 miles across the desert, with hundreds dying of starvation and exposure. This became known as "The Long Walk". Their new lands weren't able to support their former agriculture, and the Navajo were forced to rely on handouts from the government. 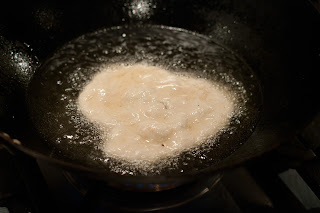 From these supplies of corn, lard, sugar and salt was born the fry-bread. For the Native Americans, eating it serves as a link with previous generations and a reminder of painful past treatment. I've made a similar dish to fry-bread before - the Italian pizza-fritta - and knew how delicious it could be. It's much lighter than you might expect for a deep fried bread. I let it rest for 45 minutes, and in the mean time made some toppings. I cooked up some minced beef with cumin and chilli powder until browned and just starting to catch. Then I chopped a pile of lettuce and tomatoes. I used a wok to get the oil nice and hot (I tested this with a little bit of dough), the split the dough into two balls and flattened each out with my hand. It's best to do this by hand, rather than a rolling pin, as the unevenness gives nook and crannies for the toppings. 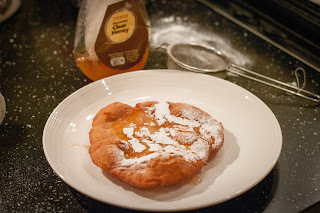 I then fried the dough, turning a few times in the hot oil until brown, and left to drain. A sweet fry-bread for dessert! 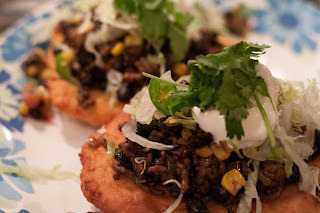 I then topped each fry bread with the beef, the left over salsa, some lettuce and tomatoes and a blob of sour cream. There's a few things I could have tweaked - because I'd put a lot of research into getting the bread right, I didn't quite get the flavours right in the ground beef.